Hand geometry systems have the longest implementation history of all biometric modalities. David Sidlauskas developed and patented the hand geometry concept in 1980s and the first commercial hand geometry recognition systems became available the next year. The 1996 Olympic Games implemented hand geometry systems to control and protect physical access to the Olympic Village. Many companies implement hand geometry systems in parallel with time clocks for time and attendance purposes. Walt Disney World has used a similar "finger" geometry technology system for several years to expedite and facilitate entrance to the park and to identify guests as season ticket holders to prevent season ticket fraud. The devices use a simple concept of measuring and recording the length, width, thickness, and surface area of an individual’s hand while guided on a plate. Hand geometry systems use a camera to capture a silhouette image of the hand. The hand of the subject is placed on the plate, palm down, and guided by five pegs that sense when the hand is in place. The enrollment process of a hand geometry system typically requires the capture of three sequential images of the hand, which are evaluated and measured to create a template of the user’s characteristics. Upon the submission of a claim, the system recalls the template associated with that identity; the claimant places his/her hand on the plate; and the system captures an image and creates a verification template to compare to the template developed upon enrollment. A similarity score is produced and, based on the threshold of the system, the claim is either accepted or rejected. The US government has sponsored two evaluations of hand geometry technology. The 1996 Evaluation of the INSPASS Hand Geometry Data determined the effect of a threshold on system operation, established false accept and false reject rates as a function of the threshold, and presented an estimate of the Receiver Operating Characteristics (ROC) curve for the INSPASS system. The evaluators noted that an estimate was the best that could be achieved with the available data. A 1991 Performance Evaluation of Biometric Identification Devices evaluated the relative performance of multiple biometric devices, including hand geometry. 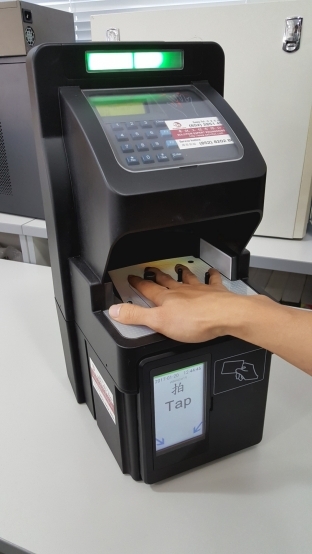 Hand geometry recognition systems are widely used for applications in physical access, attendance tracking, and personal verification. They have found a sustainable market niche through use in security and accountability applications. Their ease of use, stand-alone capabilities, and small data requirements make them a popular choice for those in need of verification systems. Copyright © Solution Expert Technology Limited. Powered by Solution Expert.